I was a little hesitant when I purchased this product, but I’m pleased to say that it has definitely grown on me as we have had a chance to use it in our everyday lives. 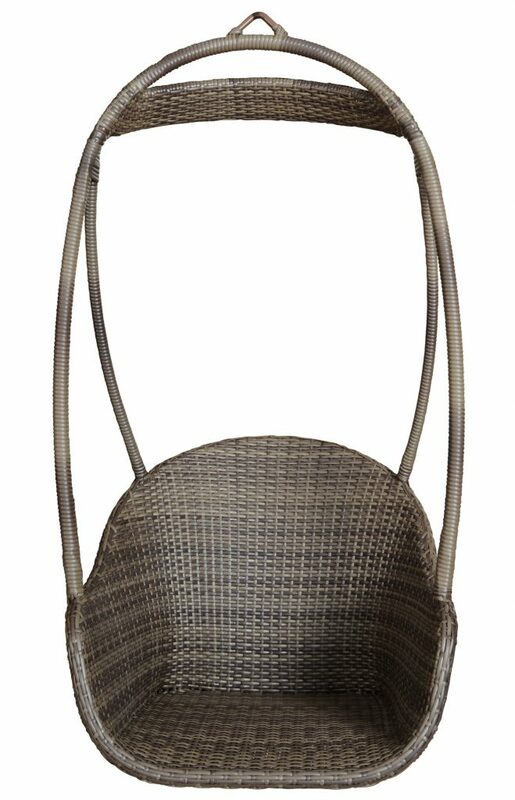 Full disclosure: I have named my Panama Jack wicker swing chair ‘Jackson’, and you know what they say about naming things– I’ve become attached! 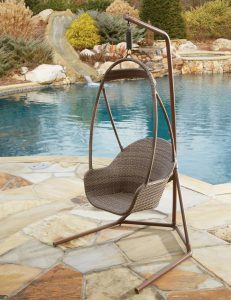 This all-weather, waterproof garden swing chair has a solid construction consisting of a very high quality, extruded, tube-like aluminum frame with an absolutely gorgeous, espresso-colored Viro synthetic fiber weaving. The frame itself boasts extra walls for added support and durability, and the whole thing is both weatherproof and resistant to the sun’s scorching UV rays. It measures fifty inches tall, twenty-nine inches long, and twenty-three inches wide. This swing is not sold with a hanging kit. 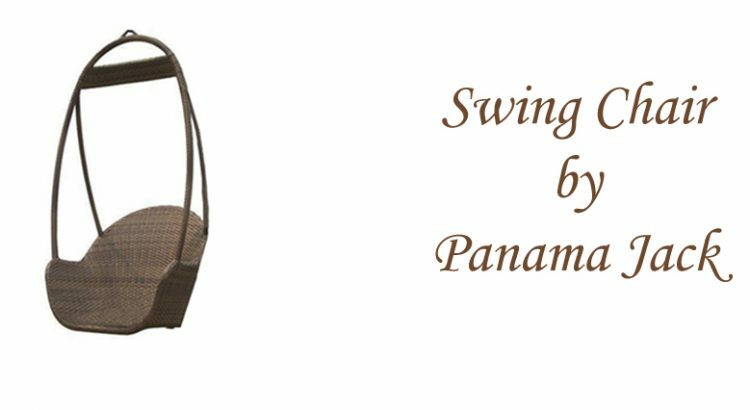 My very own all-weather Panama Jack swing chair, Jackson, reminds me a lot of my best friends growing up: it’s resilient, it does well under pressure, and it makes me feel all warm and fuzzy inside when I look at it in the morning. What impressed me from the get-go was the quality– this thing is built to last! I have since learned that Panama Jack’s outdoor frames are all welded by hand and inspected both for their integrity and their beauty, and it shows in the final product. Examining my brand new chair for the first time, I wasn’t left feeling like I had purchased some flimsy, mass-produced product that had never seen the light of day. I loved the finished, elegant look provided by their hand-sanding and polishing. It was obvious from the moment I opened the box that the manufacturers took pride in their work. In the picture I saw online, the chair’s material looked almost like plastic (ew! 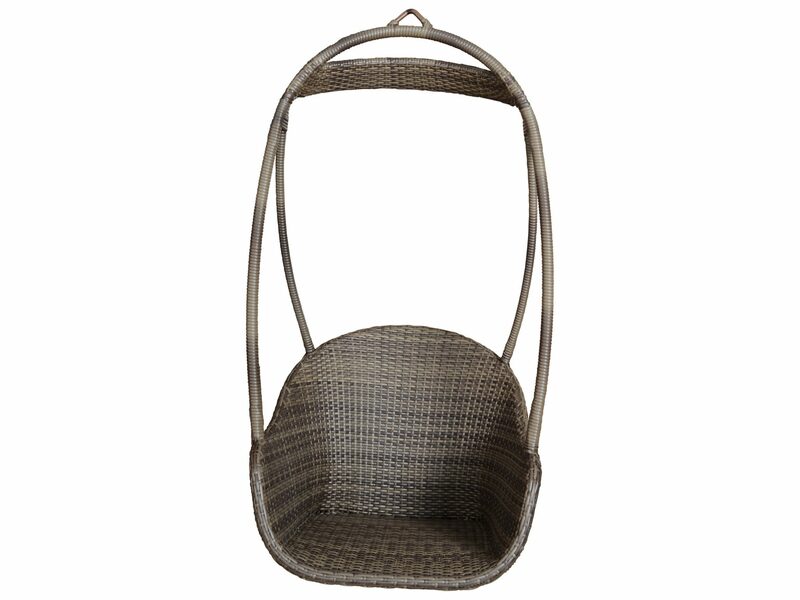 ), but in person, it’s made of absolutely gorgeous, shiny, natural-looking synthetic wicker. The shine is lovely, not artificial. It doesn’t look like a cheap imitation. Initially, I was a little put off by the fact that this chair didn’t have a built-in cushion, but HOLY COW, you don’t even need one! The beautifully designed woven material is comfortable enough to lull even the most stressed-out of my household to sleep in the middle of the afternoon. It’s soft and easy on your muscles without feeling fragile or unsupportive. We have also found that the color is perfect for our front porch– we tend to be seasonal decorators, and the espresso color is pretty yet unobtrusive enough that we can still decorate our yard as usual without worrying about the colors clashing with our new furniture. Somehow, the chair even looked good covered in the lime-green streamers of a boy toddler’s birthday party. That’s impressive! I was expecting to give a far more critical review, but I’ve got to take my hat off to Panama Jack: they’ve turned this skeptic into a believer. This chair is attractive, comfortable, versatile and well-made. It swings gently (much to my kids’ dismay), so it’s perfect for reading, napping or just relaxing. The aluminum frame is very strong, but it’s also hollow, which means that the chair weighs only 20 pounds! This makes it very easy to move the chair for cleaning (or just to find a patch of shade). We have also discovered that the chair is both dog-proof and kid-proof, thank goodness! It can withstand dog paws (though, of course, I don’t recommend letting your German shepherd try to eat the chair arm) and the spilled fluids that come with young kids. The chair itself is very easy to clean with a brush and a little bit of detergent. When it’s attached to Panama Jack’s hanging chair base, it has a capacity of up to 300 pounds, so I can let the kids sit in my lap without worrying. I recommend buying the Heavy Duty Swing Chair Protector, which is perfect for keeping the chair clean and dry. Though I had my doubts going in, Jackson has won my heart– and a name. I definitely recommend this product for anyone looking for a durable, pretty-yet-unobtrusive chair that can go with the flow of your crazy, ever-changing household. There are a ton of brightly-colored hammock chairs, but I found a couple of products similar to this one on Amazon. The Great Deal Furniture’s brown hanging swing chair (check here) was another one I looked at. 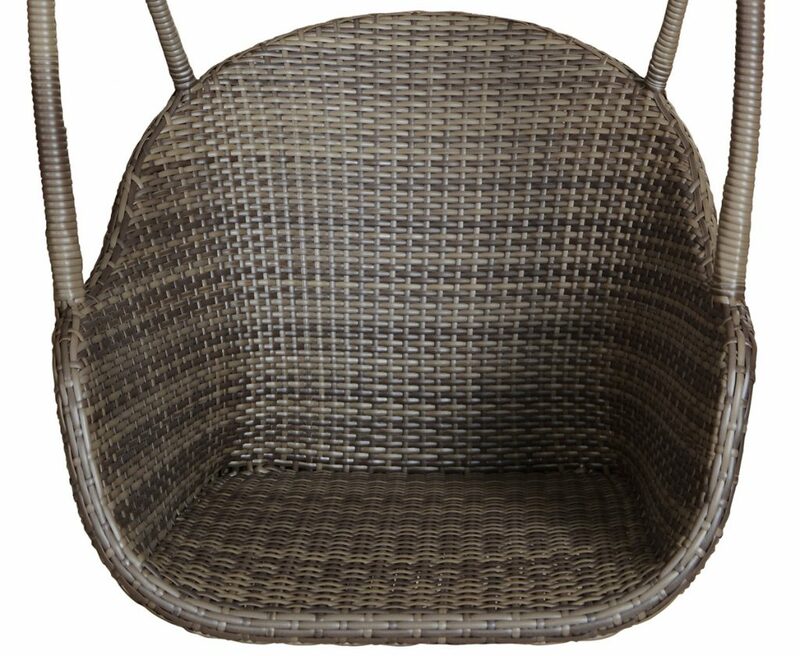 It is also made from all-weather brown PE wicker material, but bigger than Jackson and with cushions included for comfortable seating and lounging.